Please note that Autisme Montréal is in no way associated to the different projects presented here. 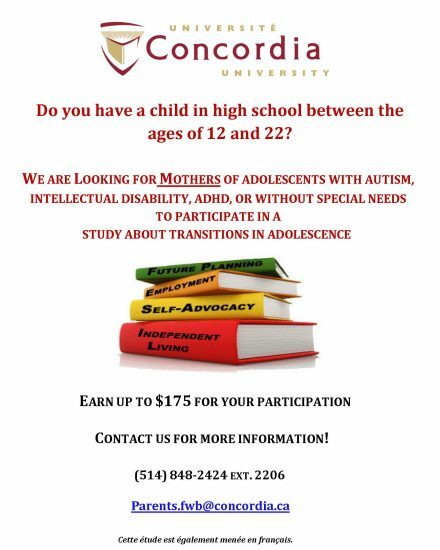 – Have a child with autism who has a sibling without autism between ages 5 and 14? – Want to better understand how your child without autism is coping? 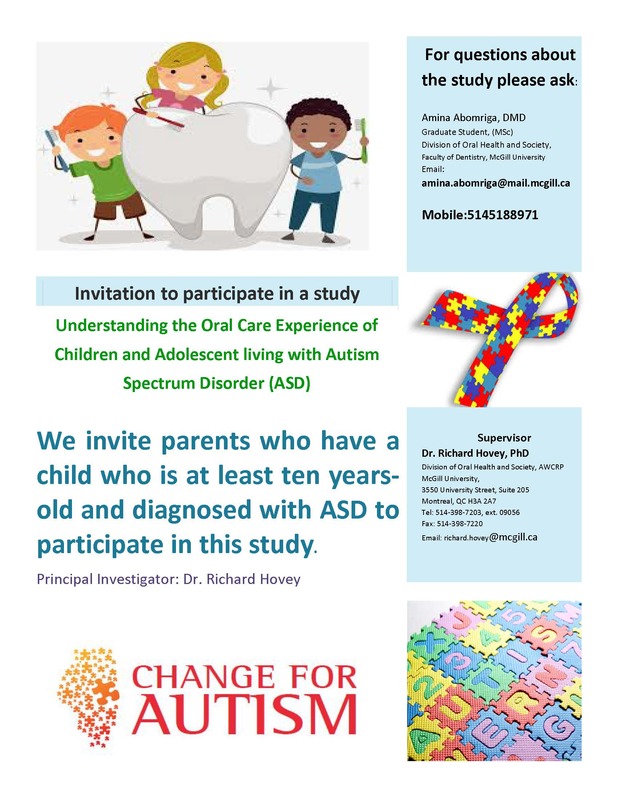 – Want to further research on families with a child with autism? 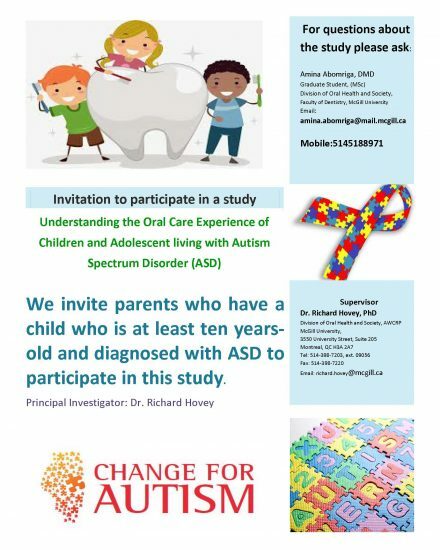 Your child with Autism Spectrum Disorder (ASD) is in Kindergarden or grade 1 and you live in the Montreal region? UQAM is looking for participants for a research financed by the Fonds de recherche Société et Culture (FRQSC) on the transition from preschool to primary school of children with ASD. The research aims at understanding the unique experience of parents and teachers in order to support the schooling of children with ASD. Part of the research will consist in using an Ipod to take pictures or record videos that you will choose to share with us during two interviews (one this current year, the other one next year) on your involvement as a parent supporting his/her child in his transition. You will be able to keep this Ipod as a thank you for your participation to this study. If you are interested or have any questions , please contact our research team at verslapremiere@gmail.com or Céline Chatenoud, professor at UQAM’s Education and Training Department at celine.chatenoud@uqam.ca. We are a research group part of the PoP lab at McGill University supervied by Dr. Aparna Nadig. We study cognition and language development in children with and without autism spectrum disorders. We are currently conducting two studies on bilingualism and and social cognition with interested families with children between 5 and 11 years old. 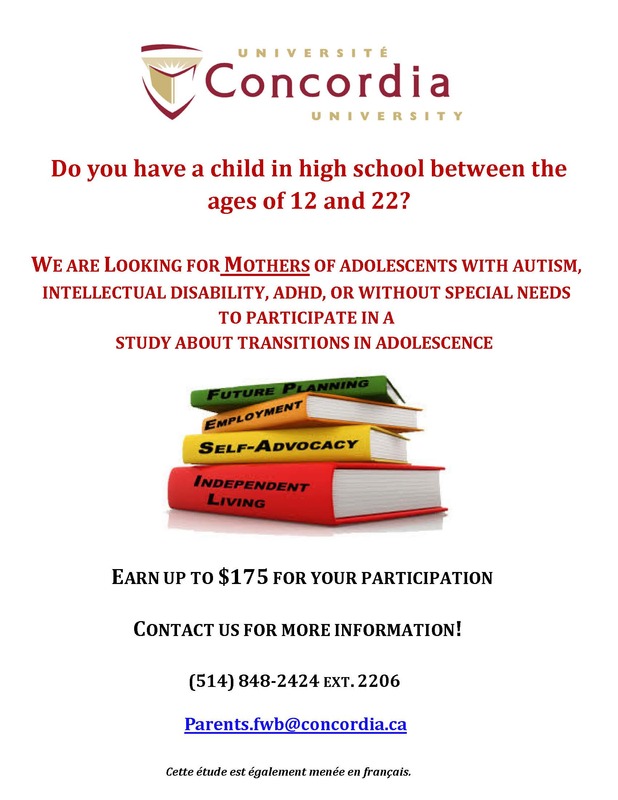 If you would like more information you can contact us by email (poplab.scsd@mcgill.ca) or call us at 514-398-6895.